urkey’s local elections on Sunday, following a period of intensifying volatility in the country’s economy, produced shocking results. President Recep Tayyip Erdoğan—who had framed the elections as a referendum on his rule—together with his Nationalist Movement Party (MHP) electoral partner received a whopping 51.6 percent of the vote. Although the Justice and Development Party (AKP)-MHP coalition won a majority of votes overall, it performed poorly in major cities. Out of Turkey’s seven largest metropolitan mayorships (Ankara, Adana, Antalya, Bursa, Gaziantep, Istanbul, and Izmir)—five of which had been governed by his AKP and one by MHP—only two now remain in AKP hands, Gaziantep and Bursa. The AKP won only Gaziantep comfortably, while in Bursa—a former Ottoman capital and a longtime urban AKP stronghold—the opposition runner-up trailed the AKP candidate by less than 3 percent (compared to a margin of over 20 percent in the 2014 election). Given these upsets in Turkey’s main cities, Sunday’s elections were a pyrrhic victory at best for Erdoğan. They showed that elections still matter in Turkey and that the country may be on the cusp of significant political changes. The AKP lost the mayorship of the capital of Ankara, which it held since 1994, to the opposition candidate Mansur Yavaş. The AKP fielded the successful former mayor of the Anatolian industrial city of Kayseri, Mehmet Özhaseki. He lost even though the AKP almost completely controlled the media coverage and Erdoğan threatened to make life miserable for Yavaş and his administration if they won. Although the AKP has called for a recount, it is difficult to see how such a recount would close the 4-point lead Yavaş enjoys. The AKP’s bid in Izmir—Turkey’s third-largest city and the Aegean stronghold of the main opposition Republican People Party (CHP)—also failed dramatically. The popular former minister of the economy Nihat Zeybekçi lost by a decisive 20 points (in 2014, the AKP candidate lost by 14 points). Much more surprisingly, the Mediterranean centers of Adana and Antalya also fell to the CHP, frustrating the AKP’s attempts to tap into the strong nationalist sentiment in these provinces through its alliance with the staunchly right-wing MHP. The CHP also won the urban centers of Mersin and Hatay in that region, meaning that Erdoğan’s AKP, for the first time since it came to power in 2002, is almost entirely locked out of Turkey’s Aegean and Mediterranean littoral. Lastly, the AKP lost almost a dozen smaller but important cities in Anatolia to its ally MHP cities where each party ran with its own candidates. Most importantly, however, the fate of Turkey’s largest and most significant metropolitan mayorship has all but slipped out of the AKP’s hands. In Istanbul—which has nearly 15 percent of Turkey’s 57 million voters and 31 percent of its GDP, and is where Erdoğan himself began his political career—two candidates claimed victory. Turkey’s state-run Anadolu Agency abruptly stopped reporting the results after AKP candidate Binali Yıldırım claimed victory over CHP candidate Ekrem İmamoğlu with over 1 percent of the ballot left to be counted and a lead only of about 5,000 votes. Turkey’s Supreme Electoral Council also uncharacteristically stopped presenting results. Surprisingly, Erdoğan himself seemed to hint that his party may not have won in Istanbul—although an AKP spokesmen restated the party’s claim of victory later on Sunday night. Late on Monday, Turkey’s election board confirmed that İmamoğlu had won, although the results are considered “unofficial” until the end of an appeals period. Yıldırım himself acknowledged his opponent’s lead, but has stopped short of officially conceding. Instead, in a last-ditch effort, the AKP asked for a recount, which will be completed by the end of the week. Regardless of the final official outcome, this picture stands in stark contrast to 2014, when the AKP won Istanbul by over half a million votes. In fact, the AKP has run Istanbul—Turkey’s crown jewel—for a quarter-century. Binali Yıldırım, a former prime minister, is one of Erdoğan’s closest and most popular lieutenants. 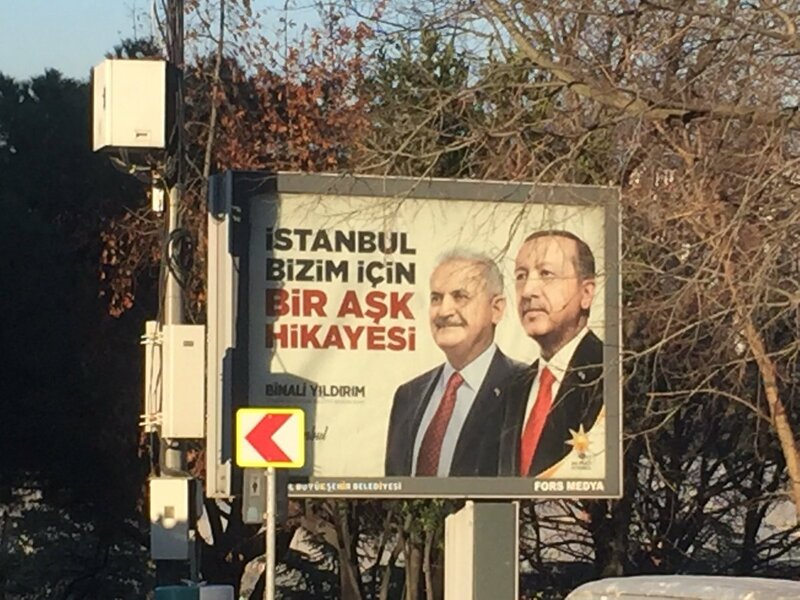 Erdoğan campaigned energetically on behalf of Yıldırım and appeared in all his campaign posters, including one that declared the two men’s “love affair with Istanbul.” They held a last-minute rally that more than 1.5 million people attended. This stood in stark contrast with the un-glitzy Ekrem İmamoğlu, a municipal mayor whose name was virtually unknown by even the closest observers of Turkish politics when he announced his candidacy. But his folksy and amicable style, a breath of fresh air in an increasingly aggressive political climate, appear to have charmed enough Istanbulites to overcome AKP’s “love affair” with the city. MORE OF THE SAME? OR NEW POLITICS? The upsets to AKP rule across Turkey come at a time when some commentators had argued that Erdoğan is “weak” but “invincible.” Both of these attributes are reflected in his growing authoritarianism and increasingly aggressive and polarizing style of politics that evokes a profound siege mentality: In the lead-up to the election, Erdoğan repeatedly used the shocking video footage from the New Zealand mosque attacks during campaign rallies, depicted the opposition as terrorists and traitors, and blamed Turkey’s economic ills on internal and external conspirators seeking to undermine a Turkey otherwise ascendant under his leadership. Is a new kind of politics emerging? Voters apparently did not respond too well to the AKP-MHP campaign message that the “survival and continuity” of the Turkish state quite literally depended on them. The successes of Ekrem İmamoğlu in Istanbul and Mansur Yavaş in Ankara perhaps hint that Turkey’s opposition, notorious for being ineffectual and factionalized, may finally be finding some footing. İmamoğlu, a self-described pious “social democrat,” lauded for his ability to connect with seculars and religious conservatives alike, related well to the rank and file of both the CHP and its nationalist ally, the Iyi (Good) Party. Much more importantly, during the most critical moments of Sunday’s intense ballot-counting process, he kept his cool and maneuvered skillfully to mobilize his base and mount a social media campaign to ensure transparency. Similarly, Ankara’s new mayor Mansur Yavaş, though not at all shy about his roots as a former member of MHP and a nationalist, managed to win only because he retained the full CHP base and made inroads with disillusioned AKP voters. Ironically, the styles of these two emerging figures resemble that of Selahattin Demirtaş, who gained much popularity in recent years for his trailblazing insistence that the Kurdish Peoples’ Democratic Party (HDP) adopt an agenda typical of an all-Turkey social democratic party, rather than one with a solely Kurdish base. Since the breakdown of a ceasefire between the Turkish state and the Kurdistan Workers’ Party (PKK) in the summer of 2015, the HDP has been portrayed as nothing more than the political wing of a terrorist organization. Many high-ranking members of the party, including Demirtaş, remain in jail; and any (non-demonizing) coverage or even mention of the party in the Turkish press is essentially taboo. Perhaps even more importantly, however, Erdoğan has successfully made the rest of Turkey’s opposition succumb to a new political discourse where the insinuation of even the smallest collaboration or understanding with the HDP constitutes a political sin instantly associated with treason and terrorism. Neither Yavaş nor İmamoğlu mentioned the HDP during their initial victory speeches—despite the fact that Demirtaş had, in a last-minute rallying cry, encouraged his base to vote for the opposition alliance. Yet both, in an implicit acknowledgement of the importance of HDP voters in ensuring their victories, emphasized in their speeches the importance of embracing Turkey’s ethnic, religious, and social diversity as well as greater democracy and rule of law. These developments may well be pointing to a “new politics” in Turkey. While the AKP still commands an impressive 44 percent of the total vote, Erdoğan, long the fastest learner in Turkish politics, hinted vaguely on Sunday night to mistakes made by his own party. He said he will focus on strengthening Turkey’s increasingly fragile economy—which is widely recognized as having precipitated the AKP’s troubles in the elections. But before Erdoğan can turn to whatever financial and structural reforms he may have in mind for an increasingly beleaguered Turkey, he will be preoccupied by attempts to continue to square the circle. His continued dominion over Turkish politics will require managing a heavily centralized presidential system. At the same time, however, he will need to adjust to the fact that the electorate handed control over Turkey’s political and economic capitals, Ankara and Istanbul—as well as a multitude of other cities—to the opposition. In his victory speech, Erdoğan failed to acknowledge this new reality, choosing instead to detail the AKP’s own successes. This suggests that Erdoğan may well double-down on divisive politics instead of recognizing the emerging elements of a “new politics” displayed by the results of Sunday’s election. His choice may prove problematic if he fails to get Turkey out of its recession and if the newly invigorated opposition overcomes its differences, developing a vision and political program that can win over at least some of the joint AKP-MHP base. More importantly, the results demonstrate that Erdoğan is not invincible. Hence, Turkey may well be at the cusp of a new era in politics and, contrary to Erdoğan’s assurances to his base Sunday evening, this era may be too impatient to wait for another 4.5 years until the next elections. The Turkish president may have downplayed the importance of the municipal elections and stressed his own unchallenged position at the helm of the Turkish state; but it would be unwise to assume that Sunday’s shocking municipal election results will not profoundly affect national politics in Turkey.